Here are a few of my favorite Dad-Inspired oils to think about gifting him this year! PINE - My hubby likes to wear this as a cologne, mixed with Cedarwood, Orange, and/or Patchouli. It's earthy, subtle, and has a calming, grounding aroma. Also, if you're nervous about any unwanted critters in your bed at night, spray your mattress down with a 4 oz spray bottle of water with about 5 drops of Pine EO. It's also a great oil to promote emotional balance. PANAWAY - This is a great oil for dad to take with him to the golf course! I remember my dad coming home from a day on the links and spending the next couple of days complaining about how much the muscles he used while playing were bothering him. Rubbing Panaway on uncomfortable muscles will help alleviate those feelings. This oil is a blend of Wintergreen, Helichrysum, Clove, and Peppermint. STRESS AWAY - Diffuse this oil about 15 minutes before dad gets home from work so he comes home to a nice peaceful environment. This is also a great oil for him to blend with Pine for that nice cologne roller. He can apply a drop to his wrists, temples, or neck for and inhale deeply for an overall sense of calming. Another great idea for dad is to keep a spray bottle with Stress Away in his car for a relaxing while he's on his way to and from work. This oil is a blend of Copaiba, Lime, Cedarwood, Octotea, and Lavender. This oil is a blend of Tangerine, Orange, Ylang Ylang, Patchouli, and Blue Tansy. CITRONELLA - Make dad a roller or spray using this oil when he's outside mowing the lawn, grilling, or golfing when it's buggy out. No one likes those pesky critters! Properties of this oil also include digestive support and deodorization. LIME VITALITY - Because this oil is in YL's Vitality line, you can ingest it. I'd recommend giving dad a drop of this oil in his fresh ice-cold Corona! Perfect while he's relaxing on his special day. It's also a great addition to any marinade or salsa! I like diffusing this with Peppermint too. This oil, along with all of the others mentioned, has some amazingly health-supportive properties that I highly encourage you to research on your own! I have to remain compliant for YL's sake, but there are numerous articles and websites out there with endless info that will keep you wanting more! Please feel free to email me with any questions! Happy oiling! The above photo is not an accurate depiction of what comes in the kit. However, this is the Desert Mist Diffuser you'd get along with your 11 5ml bottles of Essential Oils, Thieve Cleaner and Ningxia Red anti-oxidant drink samples, and more! >>> Interested in a Starter Kit but feeling unsure about spending the $160 up front? Email me directly to ask about the payment plans I offer! Receive a FREE subscription to my favorite magazine - Mother Earth Living - when you purchase your Kit! Curious about what's in the Kit? Click here for a breakdown of what you'd receive! 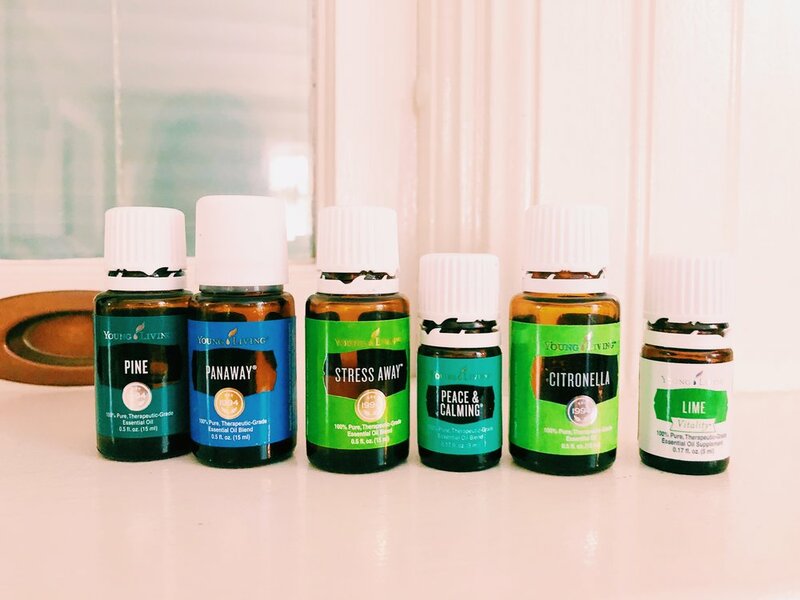 Thinking about hosting an Essential Oils class for friends and family either in your home or through Instagram or Facebook? I'd love to come teach all about all of the WHY and HOW to incorporate EO's into daily life, and why Young Living's high standard of oil distillation combined with their 25+ years of experience and quality business tactics add up to make for the right investment for anyone looking to promote health, wellness, and toxin-free products into their everyday lifestyle. Email me if you're interested at hello@sunflowerandfig.com! Note: Hosting a class doesn't require anything on your part, nor any ties to the business side of Young Living. All that's needed from you is your hospitality! And if you don't have a Starter Kit yet but are interested in getting one - let me know because I'll share how hosting a class can effortlessly help you attain your kit!